Two centuries ago, the floor of the Central Valley was largely a marshy wetland. In the springtime, the snowpack would melt, swelling the rivers beyond their banks and casting the young fish out onto the floodplains. There they would stay for months, fattening up on the abundant zooplankton and invertebrates until the floodplains drained, signalling the time to migrate to the ocean. However, the construction of levees to control flooding of cities and farmland also separated the rivers from their floodplains, denying access to native fish who have evolved to take advantage of the habitat. 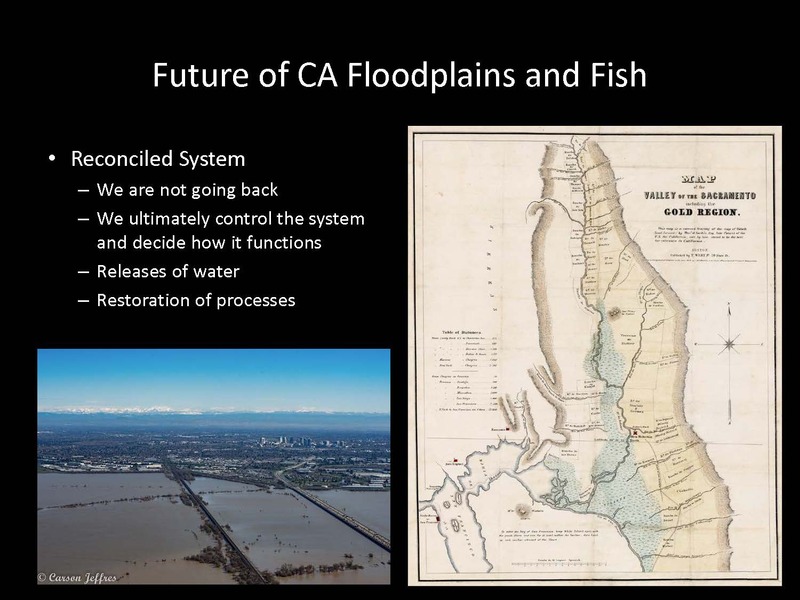 In this brown bag seminar, Dr. Carson Jeffres discusses how historically California’s native fish have evolved to take advantage of floodplain habitats in the Central Valley, and how restoring the connection of the rivers to the floodplains can help restore struggling fish populations. Dr. Jeffres began by noting that California is a diverse place from north to south. In the far north, there are the spring-fed rivers and streams of the Sutter Cascades around Mt. Shasta and Mt. Lassen which have very stable hydrology, very cool water, and very unique assemblages. The Central Valley has big floodplains where the Sierra Nevada drains down and coalesces into large rivers on the valley floors. The Coast Range and the redwoods are fog-dominated and very cool. 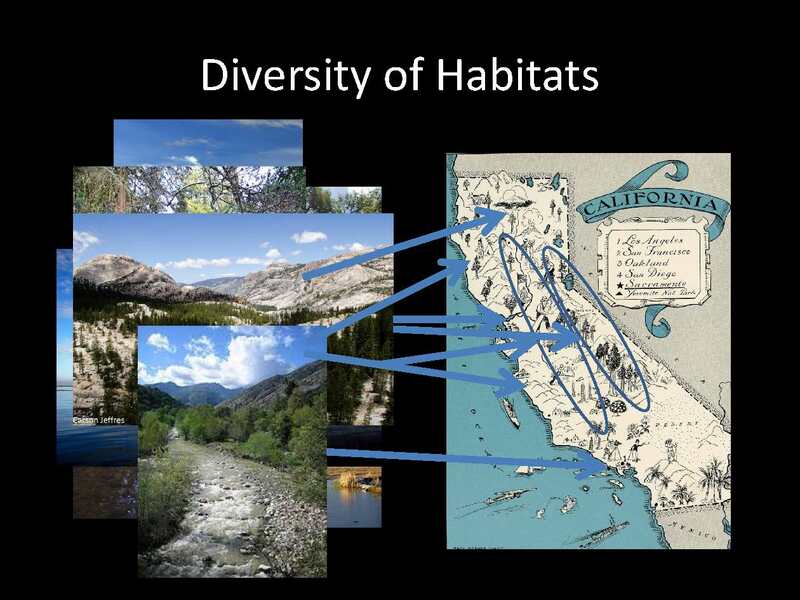 The high Sierra has a very unique assemblage; Dr. Jeffres noted that in the high Sierra, the fish diversity is very low. The Delta is this big mixing pot between what comes through the Central Valley and what comes in from the ocean. And then there are the Southern California deserts. 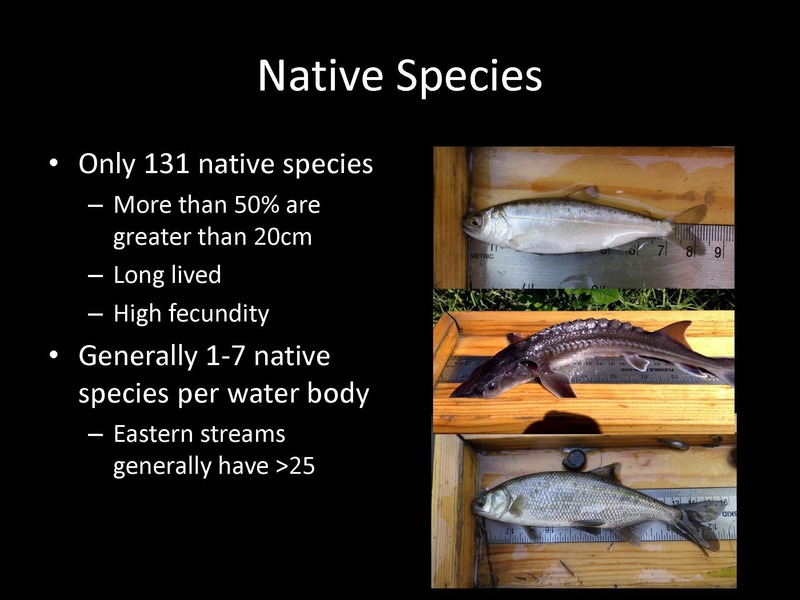 California has relatively few native fish, compared to other parts of the country, he said. There are a lot of unique fish, but a lot of diversity as compared to other places. He explained that California is relative new on the evolutionary landscape; after the rise of the Sierra and the rise of Coast Range, California was isolated for about the last 20 to 70 million years. The climate is rather harsh with dry summers and wet winters sometimes, so the fish that are here ultimately evolved under that climate regime in the diversity of geologic provinces that the state has. 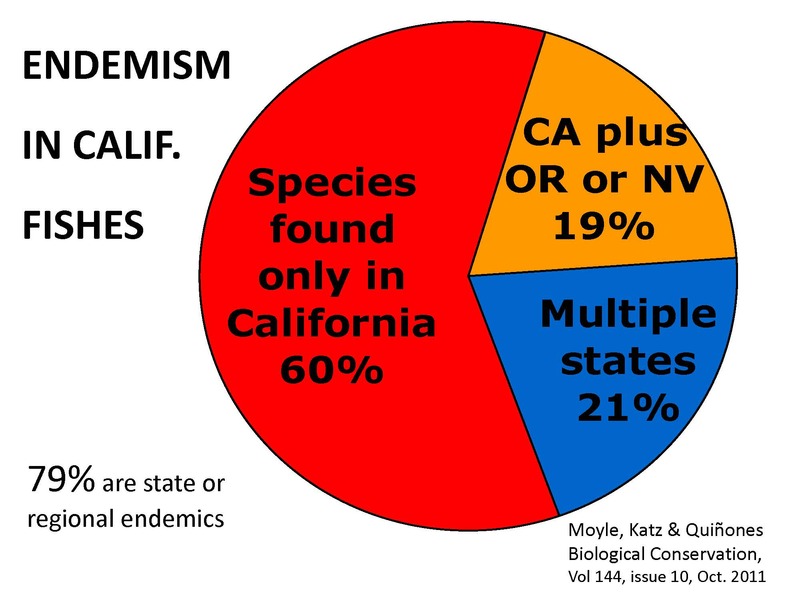 Roughly 79% of California’s native fishes are endemic to our region, meaning they are found in California or neighboring states, but nowhere else in the world. “That’s pretty unique, and I think a lot of it goes to our unique hydrology and our climate,” Dr. Jeffres said. 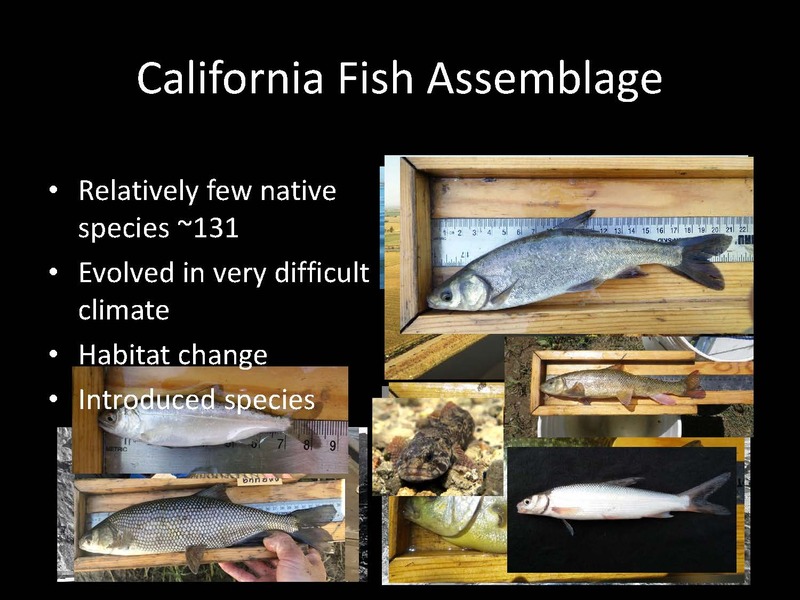 Out of the 131 native species found in California, half of them are relatively big fish – more than half of them at their adult stage are greater than 20 centimeters. They are relatively long-lived, which makes them better able to deal with droughts. 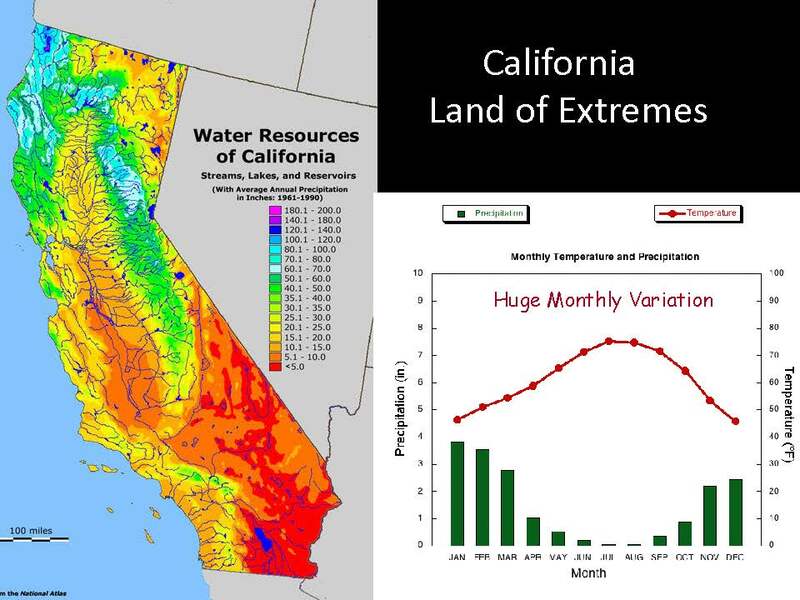 California is a land of extremes, Dr. Jeffres reminded. Most of the precipitation falls in the north, most of the people live in the south, and the state has developed an extensive plumbing system that allows all of us to be here, he said. In any year, there is a wet period and a dry period, and every summer there is a drought where the rivers get low and warm. Even under historic conditions, that’s part of how the system worked. To be able to take advantage of the rapidly changing conditions, fish have adapted in several ways. They have physiological adaptations that enable them to tolerate high temperatures, high alkalinity, and low dissolved oxygen conditions; these help fish deal with conditions if they are stuck there. The other way is behavioral: the fish can move either within the watershed or leave the watershed and move out to the ocean. Floodplains are the land along the river that is subject to seasonal flooding; they also make great places for people to develop because it was flat and right next to the river, which were the historic pathways for transportation. The Cosumnes River is unique as it only has a small number of diversion dams, so it is one of the last places in the Central Valley that actually sees a relatively natural flow regime, he said. Historically, much of the Central Valley was a big wetland; the Sacramento Valley was getting inundated basically on an annual basis, he said. About 95% of those wetlands are now gone; they’ve been developed for agriculture or urban uses, and most of the remaining wetlands are either part of the reserve system or are duck clubs. 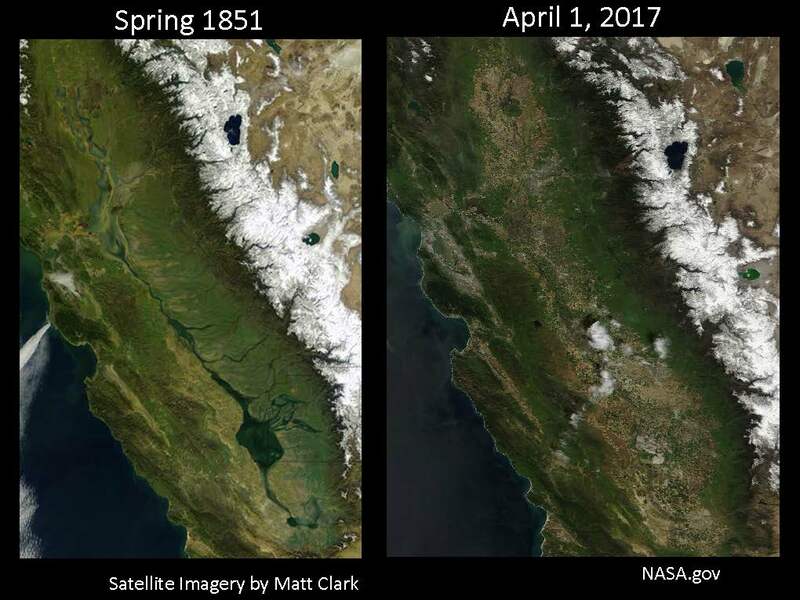 Dr. Jeffres presented two pictures, the left being a reconstruction of what California might have looked like in 1851, and the one on the right a recent satellite photo from 2017. Pre-development, there was an immense amount of habitat throughout the Central Valley, but in the picture on the right, the Yolo Bypass and the Sutter Bypass are full and yet they can’t really be picked out on the landscape. A lot of the other habitats that are left aren’t great ecosystems, and we’re obviously not going to be taking people out of homes, so how can we work with what we have and what are our options for moving forward? 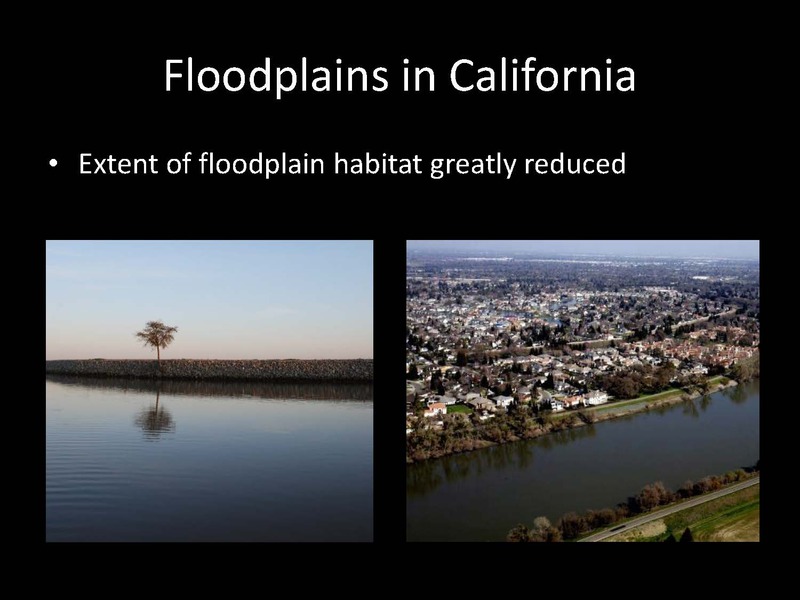 Dr. Jeffres said there are basically two types of floodplains: restored floodplains and managed floodplains. The Cosumnes River is an example of a restored floodplain; it’s the only place that still has a relatively normal functioning hydrograph and there are geomorphic processes occurring, such as a lot of sediment that flows through the river, he noted. On the Bear and the Merced rivers, the floodplains have been reconfigured and levees have been set back to create more floodplain habitat, but those rivers are still subject to upstream regulation. During the non flood season, some of the bypasses are being used as wetlands for ducks or waterfowl and some are used for agriculture although they still have to maintain flood conveyance, so they are truly a multi-use, multi-benefit system, he said. 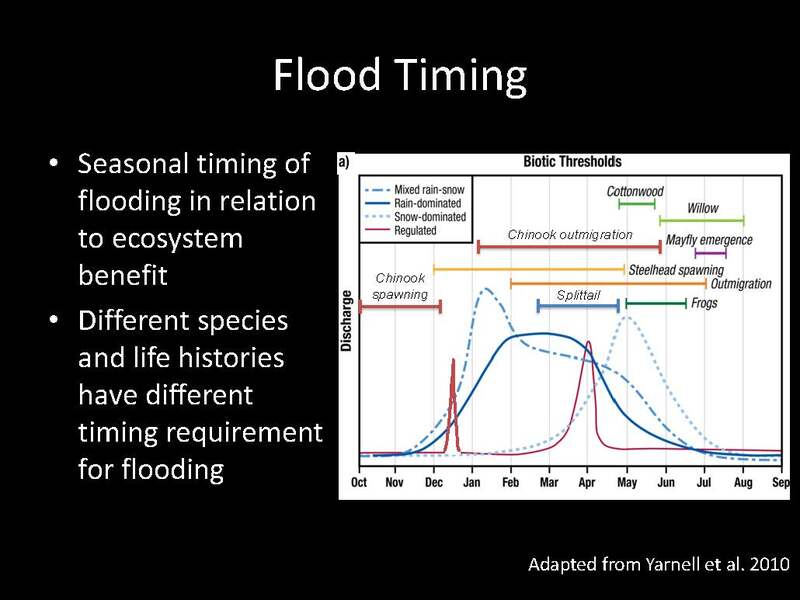 For floodplains to be useful to fish, there are three important factors: The first is timing, or when the flood happens; duration – how long the water stays on the floodplain; and then the magnitude, or how much water inundates the floodplain. He then discussed each of these in turn. 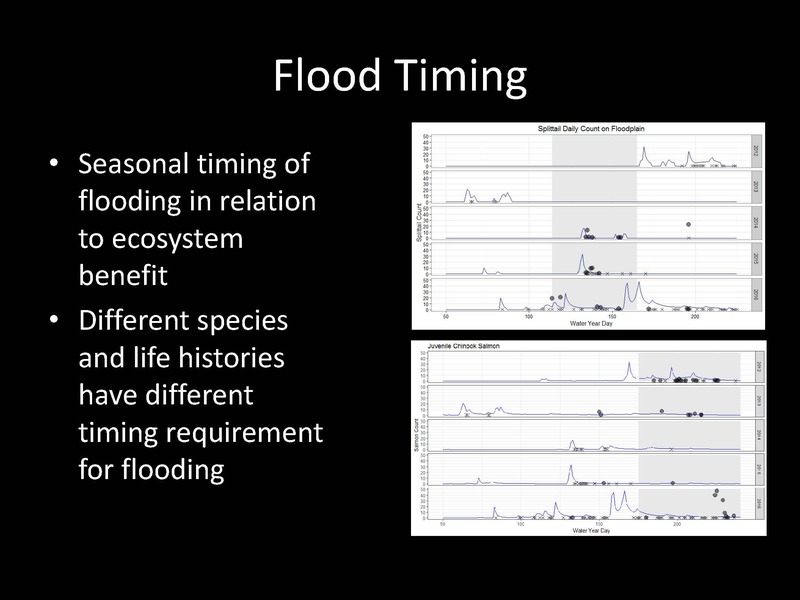 With respect to the timing of floodplains, each of the species ultimately has a different timing for when they are using habitats, whether it be for outmigration, for spawning, for emergence of the invertebrates, or for recruitment for vegetation. The dark blue line is the hydrograph for a rainfall system where rain falls and it moves through the system which is the Coast Range and some of the lower systems; the dashed blue line is a mixed rain-snow system such as the northern Sierra; and the red line is a snow dominated system, such as the San Joaquin. 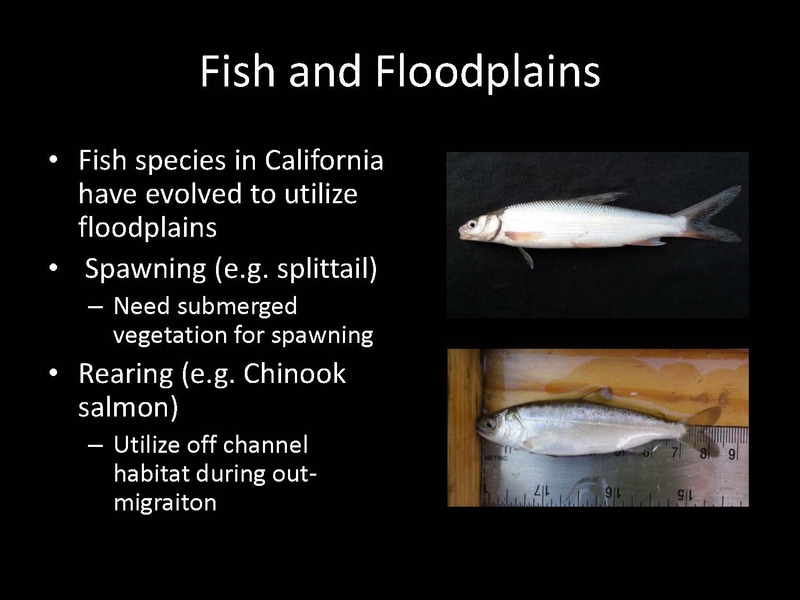 Dr. Jeffres presented two graphs showing counts of splittail and juvenile salmon on the Cosumnes River from 2012 to 2016. The splittail (top graph) use the floodplain from about February through March – April. The juvenile salmon (bottom graph) use the floodplain much later than the splittail. He noted that the black dots for chinook outside the gray window are fish that have come into the Cosumnes from other rivers to use the habitat. 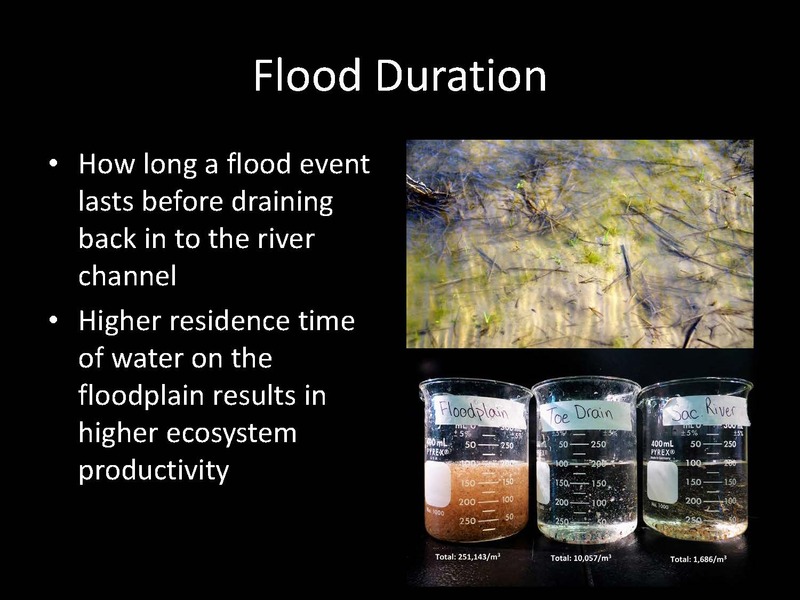 The second important factor is duration, or how long the water stays on the floodplain. Dr. Jeffres then presented a conceptual graph (below, left) for the current thinking on how the floodplain food web works. About a week after the peak of the flood, chlorophyll A is high and there is primary production; next is secondary production of zooplankton and invertebrates who start grazing down the primary producers, and then there are the fish benefits. “If you’re managing for fish, this is when we get into how long you have to have water on these habitats before you start to see benefits,” he said. He presented a slide with a picture of three samples of water from the Yolo Bypass, the Toe Drain, and the Sacramento River on the same day. He noted there were about 250,000 invertebrates per meter in the water from the Yolo Bypass versus about 1300 in the water from the Sacramento River. This demonstrates what happens when you spread that water out and slow it down, he said. The third important factor is magnitude. 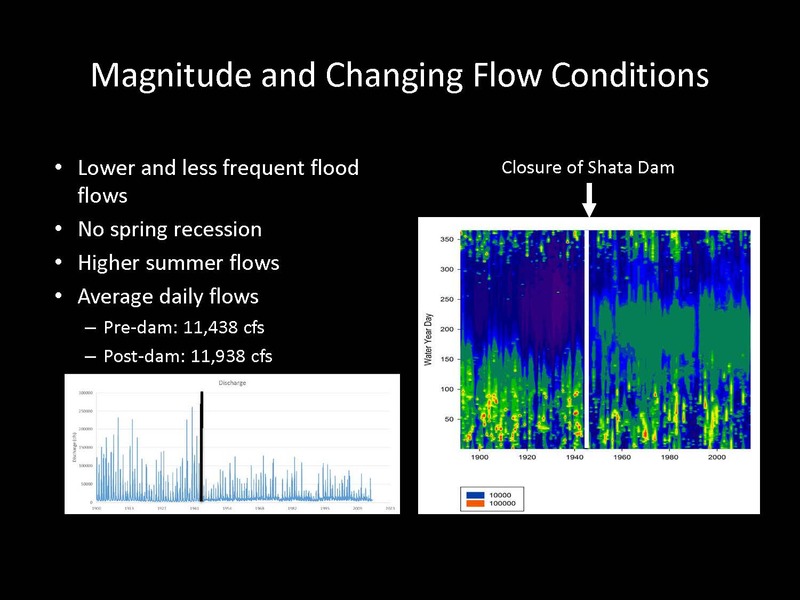 We have fundamentally changed the system; it is a system that we now manage, Dr. Jeffres said, presenting two graphs showing discharge of the Sacramento River at Red Bluff. QUESTION: In places where there haven’t been floodplains a very long time, how do we encourage the fish to actually use those? If we’re constructing new wetlands or floodplains, do they just have to wander into them? Is there some kind of signal that can be given to encourage them to go that way where there’s favorable habitat or are we at the mercy of them stumbling upon these constructed facilities? COMMENT FROM PARTICIPANT mentioned the Bullock Bend restoration site that was constructed on the Sacramento River last year. As soon as it flooded even without any vegetation in it, we caught listed salmonids and steelhead in there, so as long it’s connected when it floods, they hit it. QUESTION: One of my thoughts about residence time and also getting projects that get through permitting is that we see sometimes we want to create places that hold water on it, and yet some of the agencies say, ‘don’t create places that will strand fish. Don’t create topography that will pond areas’. But if you make it drain really nicely, than it doesn’t hold the water for long periods to get good and juicy. Any thoughts on that? Take a virtual tour of California’s floodplains. Note: This is the third in the series of three brown bag seminars focusing on flow targets and ecology.